Out of all the books that I've read in the series, this one was probably the most suspenseful and mysterious, since they found out who -A is. I thought this book was a great read. I don't know why, but this book is a lot harder to review then the other books that I've read. I apologize in advance if this review is rather... boring. The characters are backstabbing, selfish and devious. But its obviously their personality that really got to "A" to make her hate them so much. While I was reading each character, and how they act, I was always trying to give myself a reason not to hate them. But I don't know... Let's just say I wouldn't want them as my friends in real life. If you read prologues, like I do, it started out really mysterious (Geez, I really need to use better adjectives), and it caught my attention, since it was a prologue that was meant to help you reflect on your own behaviour. And then it would be switch to a flashback, when Ali and her friends were still in Grade 7. Overall, it was well written, and I think the author purposely made the characters the way they are just so it'll accompany the story better. I also loved how she would write it in each Pretty Little Liars perspective. Sometimes, I would want to read one persons perspective more then another, and that's what made it so anticipating for me. This was a great installment to the series, and I'm excited to read the 5th book and see what happens next. 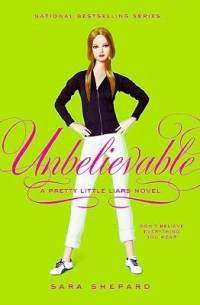 Four pretty little liars' charmed lives have turned into living nightmare. Emily's been shipped off to Iowa to liver with her uberconservative cousins. Aria's boyfriend is behind bars-because of her. Spencer's afraid she was involved in Ali's murder. But Hanna's fate is far worse: She's clinging to life in the hospital because she knew too much. If these girls don't start listening to me, Hanna's going to look like the lucky one. Do they remind you of The Clique series at all? From the reviews I have read, it seems like PLL is a little more "mean" than that series. I have read many of those, although I just couldn't keep up with the series after a while. Honestly, I don't really see any resemblance with The Clique and PLL. I guess its just because of the age difference. Haha.